Pittsburgh’s apartment market looked as strong as steel coming out of the recession. In most recent years, however, it’s been anything but. 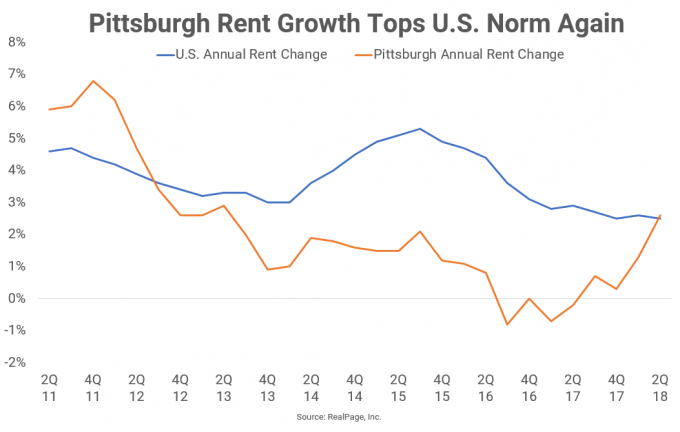 Pittsburgh was among the very few markets nationally to avoid rent cuts during the economic downturn from 2008 through 2010. The Steel City market also ranked high on the national leaderboard for occupancy as recently as 2012. But all of that is before Pittsburgh experienced one of the sharpest, most prolonged slowdowns of any market in the current cycle. Throughout much of 2016 and 2017, peak supply volumes and weak job growth suppressed occupancy and rent progress. But now, deliveries are slowing and jobs are returning to the metro. In turn, occupancy in the market is back to the essentially full mark and rent growth once again tops the U.S. average. 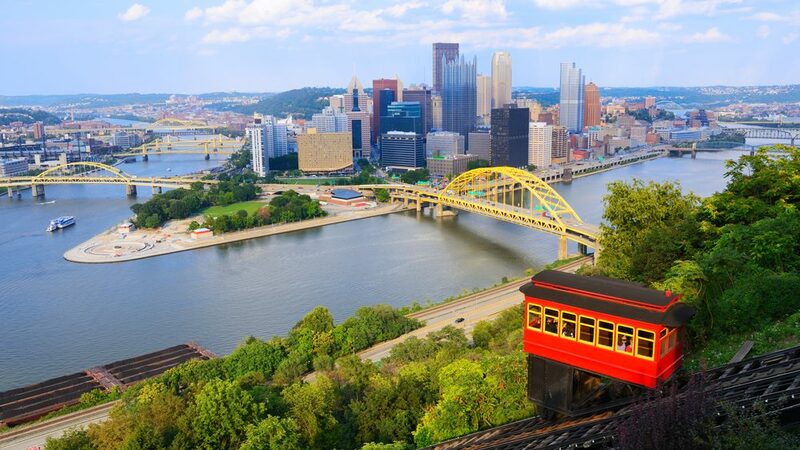 Among the nation’s largest 50 markets, Pittsburgh saw one of the strongest rent hikes during 2nd quarter 2018, and this recent increase (2.7%) put annual progress in the metro back on top of the U.S. average for the first time in nearly seven years. At 2.6%, annual rent growth in Steel City is at its highest point since 2nd quarter 2013 – quite a feat considering that yearly figure includes the steep cuts this metro suffered just a few quarters ago. Inspiring the recent upturn in rents, occupancy in Pittsburgh is essentially full – at 95.1% – for the first time in two years. While most of the country has seen minimal occupancy movement lately, Pittsburgh was a national growth leader in recent months, with occupancy climbing 80 basis points (bps) in 2nd quarter and 140 bps for the year overall. This annual increase tied with the hike in Houston as the country’s best year-over-year improvement among large markets. While Pittsburgh’s various product class levels registered occupancy tightly clustered between 95% and 95.3% in mid-2018, the Class A stock saw notably more improvement than the lower-end units during the past year. Class A apartments saw occupancy climb 330 bps annually after dropping to just 92% in mid-2017. Recent progress is due in part to a slowdown in construction activity. Supply fell to just 1,309 units in the year-ending June. This was the metro’s smallest annual completion volume since 2015, before activity started ramping up. Pittsburgh apartment supply hit a peak in 3rd quarter 2016 at over 3,800 units. This was the steepest delivery volume the metro had seen in at least 20 years and more than three times the decade average. Pittsburgh saw its apartment stock increase by more than 7,000 units from mid-2015 through 2017, with the bulk of those new units landing in the traditionally top-performing Oakland/Shadyside and Central Pittsburgh areas. 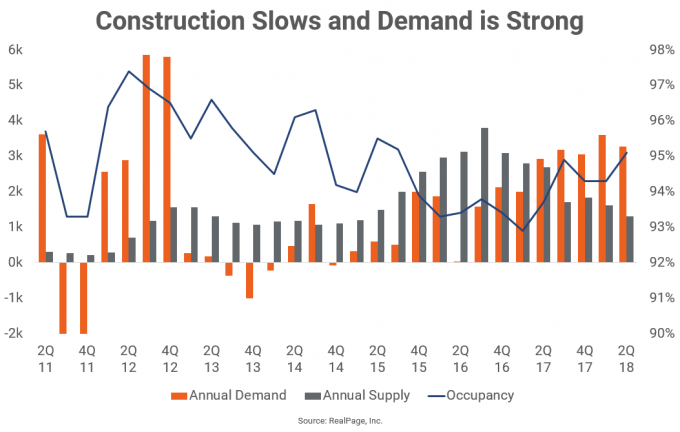 While apartment demand was unable to keep up during that peak period of new supply, absorption has been ramping up more recently, as construction activity declines. Apartment demand in Pittsburgh was strong in the year-ending June at 3,280 units, more than double the decade average and well ahead of wavering supply volumes. Look for demand to continue to top new supply in the near term, as Pittsburgh is expected to see one of the country’s biggest slowdowns in apartment deliveries in 2018. Meanwhile, jobs are coming back. After averaging minimal annual job growth of just 1,300 positions from 2013 through 2016, the Pittsburgh economy started seeing some growth in 2017. While job additions remain somewhat reserved – at about 15,000 jobs in the year-ending March – this is obviously a big difference from where the metro was just a few years ago. Looking at Pittsburgh’s key submarkets, Central Pittsburgh and Oakland/Shadyside were the two big construction centers during the 2016 to 2017 supply surge. Each of these areas saw their existing unit base climb between about 9% and 11% during those two years. Lately, the onslaught has eased, allowing occupancy in each location to get back up to the 96% mark as of June. These two neighborhoods made the most headway in Pittsburgh recently, with occupancy climbing about 300 bps in each submarket during the past year. While pricing power hasn’t returned to Central Pittsburgh just yet, Oakland/Shadyside is taking advantage of occupancy increases, with operators setting annual rent change at around 4%.